As some of you may of read I attended MCM’s Birmingham Comic Con just over a week ago, to tie in with this MCM launched a competition to win two tickets to the Divergent Premiere in Leicester Square, and guess what? I won one of the pairs of tickets! This post will mainly be about the experience but I will mention the film itself, I will put big spoiler warnings where I mention the story so just skip that bit if you want a fresh mind while watching. So after winning I thought, like most people in a wheelchair would I expect, “Can I actually go?”, maybe the cinema wasn’t accessible or they wouldn’t have wheelchair spaces on premiere day, then there was getting there. I contracted Joe from MCM who notified Entertainment One (the premiere organisers), then waited. On Friday I got an email with official details of the event (this also acted as my tickets when printed out) and promptly emailed Sof from Entertainment One, she said they would have wheelchair space for me and that the ushers would help out. So two days before the event I had official conformation that I could go on Sunday, Mum would drive and come with me (it was Mother’s day after all), I arranged one PA to come in early and another to stay on an extra hour to help out. The morning I was obviously shattered, especially as the clocks had changed that morning meaning I lost an hours sleep. We left at just gone 10 am, half an hour later than I’d hoped, and used the Google directions I’d looked up and the sat nav when it finally decided to talk, good job I remembered the route, Google map’s estimate was 2 hours and 4 minutes, it took us four hours! We didn’t drive slow so I’m not totally sure why Google was so far out, there were delays in London but not two hours worth. On arriving we found a disabled bay quite close by, it was apparently suspended due to a shoddy sign on a lamppost, but it was Sunday and most parking rules are suspended according to the city of Westminster site, it wasn’t blocking anything, and there was another car parked in the bay in front (suspended too), so I made the call to park there, there wasn’t anywhere else and my van doesn’t fit in the multi-story car parks that were the other options. So yes we got a ticket, got to love London where Blue Badges aren’t valid. We arrived at around two, so rushed to Leicester Square, we’d missed the fan experience but had time before getting to the theatre at 2:30 pm, we rushed passed the crowds and asked where to go, we had an email print out so “go round the corner and get a wristband”, we found the stand sorting tickets and Mum went off to talk to them. At this point my anxiety did start rising, she was a while, I was surrounded by bustling people, any one of whom could knock out my ventilator tube, they weren’t polite either, bashing past and cutting in front all the time, I even told one guy to “Watch it!” as he bashed into my arm, followed by an expletive, I did manage to avoid everyone else though by going extremely slow and using quick manoeuvres. After talking to the people Mum returned and we followed a burly looking usher/Security guard who took us to the red carpet, there were stars like Kate Winslet, Shailene Woodley and Theo James on the other end of the carpet, not that I really noticed, there were fans screaming behind the barriers, my anxiety was up and I was just concentrating on getting inside and saying hello to everyone who spoke to me! 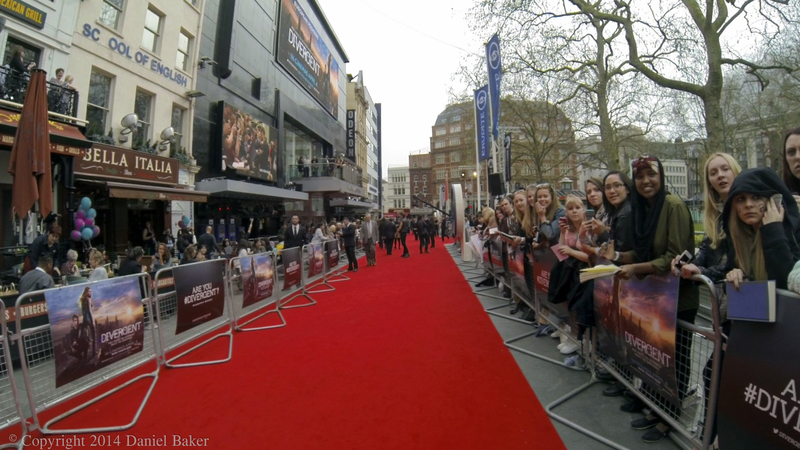 We were guided to a group of people on the red carpet who were checking out names and giving faction wristbands, after choosing Erudite the rope was lifted and I was on the red carpet proper, lights flashing, fans shouting from behind the barriers and the carpet feeling like a different world, a sanctuary even. We walked down the carpet slowly and into the theatre and our seating area ready for the film. We sat and waited while more fans arrived, it was packed and dark, my anxiety levels were still pretty high, Mum asked a manager if we could get some autographs, unfortunately that could only be done outside, and once you were in the cinema there was no leaving (if I go to another premiere I’ll remember this, and I really hope I do). After a while there was an announcement that Neil Burger would give an intro before the film. When he came down he brought the stars and author onto the stage with him, I was within a few yards of Kate Winslet! I did try tweeting, but with no data plan and the poor Odeon wifi there was no chance. I haven’t read the books, in fact I hadn’t heard about them until the films’s announcement, I think they must be more popular with females as the vast majority of fans were not men, I also managed to avoid spoilers and went with a fairly open mind and no expectations, except I did know it was one of this years most anticipated films and was doing well in the States. The film starts with a description of the ‘factions’ groups of people in the future are divided into groups depending on their characteristics, the star, Tris, is born into an Abnegation family, they are the civil servants and are selfless, at a certain point in their lives everyone takes a test to see what faction they belong too, usually their birth faction. The family life of Tris is shown a bit too briefly in my opinion, I managed to gain some empathy for the Mother and Father, but didn’t have any interest in his character at all. I guess this is the problem with book to movie translations with lots of characters, Divergent did do a good job for the most part but there were a few points where it just needed more time to develop relationships. I couldn’t help finding myself thinking of the film as a sci-fi Harry Potter for the first half, maybe that’s a good thing to be compared with, I don’t know, anyway by the final half I had forgotten that as battle commenced! The training part of the film did seem a little drawn out too, and predictable, the end of the film was far faster paced and more interesting and actually had some turns and events I didn’t expect, I felt myself routing for characters and had that weird feeling in the pit of my stomach as they did amazing, selfless things, not many movies can do that to me. The actors themselves were great, even if some like Maggie Q didn’t get enough screen time. Shailene Woodley is not your typical blonde bombshell actress, not that she’s in any way plain, but she doesn’t fit the typical Hollywood mould, she was an excellent choice though, her acting draws you in and she doesn’t seem false at all, she is also brilliant in the action scenes, a little too brilliant maybe in one of the final scenes where she fights Four maybe, I couldn’t help thinking he could of snapped her neck within seconds or just knocked her out. Theo James played the other main character, Four, I hadn’t heard of him before but again was pleasantly surprised, he can fight amazingly well and also act without seeming wooden, also surprisingly he didn’t irritate me like most teen heartthrobs in movies and TV do these days. All the supporting cast also did a great job, I didn’t find any, except maybe the brother, uninteresting. All in all the film was good, it’s probably not aimed at my demographic but I still enjoyed it, as did my Mother, I definitely want to see the sequels. After the film, although exhausted and aching I visited Trafalgar square, it was only round the corner and I hadn’t been since I was at school, it’s a fun place still, with performance artists and the famous statues, you could feel the Londonness. I wish I could visit more often, it’s one of the few places that I almost feel I belong, at one point a two or three year old girl who was with her parents turned round smiled and came over to me, I couldn’t understand what she said as she wasn’t English, but I assume “hello”, I said hi back before she returned to her parents, some children stare at the wheelchair or ask their parents questions, but this one just seemed to see the person inside, very touching. After our wander around London we returned to the van to find our ticket, great, we then headed home, stopping at one service station to buy Mum a Burger king, I had offered to buy her a proper meal but her heart was set on this, sigh, anyway she enjoyed it, we stopped at another service station for a rest too as Mum was getting dangerously tired, we arrived home finally shortly after 11 pm. The day was exhausting, when we finally got home my chest was aching, my arms, my back, my neck, my bottom, my ankle and my head sore from rubbing on the headrest, it felt like maybe I’d pushed myself a little too far, but honestly it was worth it, I went to a movie premiere! This entry was posted in Geeky, Outdoors and tagged Daniel Baker, Divergent, Kate Winslet, Movie Premiere, Neil Burger, Shailene Woodley, Theo James, video. Bookmark the permalink. I cannot begin to imagine what being on the red carpte must have felt like, what an amazing experience to have! If I’d have told you two years ago that you would be at a London movie premiere in Leicester Square you never would have believed me!